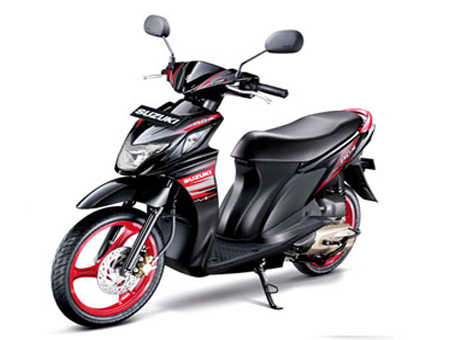 Specifications Suzuki Nex Black Fire - PT. Indomobil Suzuki Sales (SIS) has launched special edition products. This time of the variant matic namely Suzuki Nex theme of Black Fire intended for men and women are brave and want to appear exclusive, unique, extreme and aggressive in a sportive spirit. For the type of Suzuki Nex Black Fire Edition is available in two variants: Fuel Injection (FI) and the carburetor. Suzuki Nex Black Fire carry the engine 110cc with O2 sensor that detects oxygen levels exhaust gas which is then processed Engine Control Module (ECM) computationally to produce fog fuel fitting. ECM is also equipped with Tip Over Sensor that serve cut the electrical current, so the engine will shut off automatically when the motor is tilted more than 65 degrees or in the fall.